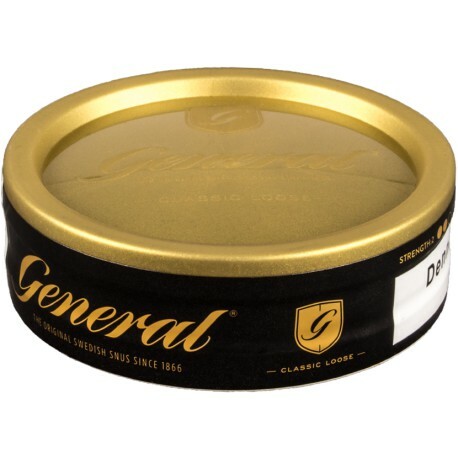 General Loose Snus is a powerful and elegant snus. The flavor is a peppery tobacco with hints of citrus zest and balanced tobacco notes. General loose (lös) has been on the Swedish market for over a hundred years. I say I'm laughing out loud because this is so good, it makes me laugh. I really like roda lacket, and Goteborgs Rap'e loose. But it's like general was trying to make Swedish match bow to their greatness. I wish I could use loose at work, I would actually chain snus this stuff. I think it's a lot better, and less bitter than the portions. The bergamot flavor is a lot more balanced, and the tobacco seems sweeter...but not sweet...if you know what I mean. I don't think it's possible to get better loose in the U.S.
As Expected, a great Los - Fantastic grind (fine) amazing smell and classic taste (think General Original Portions). Very easy to hand bake and Icetool/Mortar. Just a good solid los for anyone looking for a place to start. A classic snus from what I've heard, and I believe it! How can you go wrong with bergamot, it's just like earl grey tea! I've tried the portion version of this, and I like how the los a richer tobacco flavor. The bergamot is an absolutely beautiful compliment to the tobacco. I only knocked it back a star because the bergamot oil seems a touch astringent, so the mouthfeel of this snus seems a bit more drying than others. The Grandfather of all snus. There was a special on a 15 pack so bought it. Very moist, full bodied with a strong Bergomot flavor. Flavor lasts a long time. Definitely will be in my regular snus rotation. The finest snus I've ever used, and the baseline for all other comparison. The bergamot gives that Earl Gray flavor that I like in my teas. No nasty sweeteners or sugary flavors, at all. The tobacco is great, the consistency superb, the flavor a guaranteed hit, can after can, indicating a quality production facility and recipe. Simply the very best of the best. As a long time American user of UST products mainly Copenhagen Long cut. I find this to be the best Loose Snus out there. It's very extremely easy for me to form up a pinch without any mess at all. Taste: smooth with a very easy feel in the lip. You don't need to look any further this is the one I will always use for those times I want a bit of loose. As many others before me, I find the General taste to be exquisite. That said, I will always like to varying degrees the different varieties they come out with. I am spoiled by all the different styles of portions that come out with the General flavor. This is a classic and although I gave it 5 stars, I rarely use this one in particular. There just are so many others that just do it better for me. I would say that this is a los that every snus user needs to have tried, but who can blame me for the laziness that General brought upon me?